We have just 15 of these precision made sub-platters in silver. Runout typically within 2 microns or less. Spindle shaft typically 1-2 microns of original bearing. Physical platter is exactly same as original. This sub-platter has a unique feature where the 18mm centre collar with red rubber ring can be removed so to allow a non Rega Main platter to be used, perhaps a custom made platter with just a standard spindle hole. 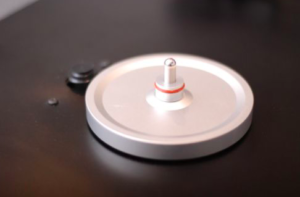 All Rega Platters have a 18mm centre hole so your pretty much stuck with whats available, with this sub-platter however it is possible to use a plethora of platters if the surface is level under the platter. If you have what you believe to be a Rega Based turntable let us know as much info and photos to identify which model you have before purchasing. We also have sub-platter upgrades for the project Xpression 2/3 & Project Debut in our other listings. The plastic lightweight sub-platter that came with your turntable listed above though good at it’s job can be massively improved upon bringing so much more detail and mass to your lightweight turntable. The bearing that came with your Rega is good quality and easily capable of carrying the extra weight of this new sub-platter. Upgrading your turntables sub-platter and/or bearing or both is one of the best and easiest upgrades you can do. Remove your old sub-platter and ball bearing. Clean out your bearing and drop the ball bearing back into it and pop around 6 drops of oil into it and on the spindle of the new sub-platter before placing it in. Be sure not to force it in just put it in a little gently turning it and let it gently self lower, which can take some time. A little oil may come up to the top of the bearing but this is normal. Why did you not change out the steel ballbearing for a ceramic ballbearing. All tests I have read seem to indicate a quieter running subplatter. For those of us who are visually impaired like myself, could you please tell me is the bottom of the subplatter shaft rounded like a ball, or is it just a straight flat 90 degrees at the end of the shaft?